Song Sparrow - the "default sparrow"
The Brits take their birds seriously. Even so (their testiness not withstanding) common European birds are a rather dull lot. I had a pair of Brits (not British birders) stay with me. They were charmed by the chickadees at the bird table, stunned by the sartorial splendor of the Blue Jays, and departed speechless when a male Northern Cardinal visited on their last morning, all experiences nearly unknown on the other side of the pond. And yes, we do have lots of little little brown birds which are often difficult to tell apart. I watched them at my feeders as I ate breakfast, a milling mass scratching the ground and covering the feeders. There were juveniles in the mix, and many of them lack the handsomeness that characterizes the adults. The plumage of adults is worn from a summer of child-rearing and has lost its crispness, but this is also a defensive tactic designed to camouflage them from predators during the winter ahead. Most of the sparrows and finches have been around all summer, but the migrants are also beginning to make their appearance. Generally, they move in fits and starts, and no further than is necessary to get plenty of food, either for further flight or against the cold. They are opportunistic foragers drawn to the bounty of bird feeders. They hang around, and so give us a good opportunity to study them, distinguish them, and enjoy their variety. With a good bird guide nearby, late September through mid-November is a perfect time to dispel the notion that all sparrows and finches are dull brown birds that look alike. Here is a quick run-through of the most common “little brown birds” which frequent my feeders during the Fall. Lining the perches of the sunflower feeder are Purple Finches. The females are plain, dull streaky brown and white birds, but the males still sport their wine red plumage, though it is faded. Occasionally an even duller brown, more finely streaked female House Finch will appear, perhaps with a faded red male, but these are more common in the towns. Littering the ground and blending in with the fading green grass are American Goldfinches. An occasional male still shows some remains of his sunburst-yellow breeding plumage, but most - males, females and juveniles - are in their drab olive green plumage. They are so well camouflaged on the ground that I am often unaware of how many there are until they burst into flight. The finches - gold, purple, and house - may be “dull” this time of year, but in breeding plumage the males are stunning. On the ground, seven species of sparrows are often scratching for food. The common Song Sparrow, often referred to as the “default sparrow,” has bold brown streaking on a white breast, often with a prominent brown “stick pin” in the middle of its breast. Uncommon at the feeders is the slimmer Savannah Sparrow. Compared to the Song Sparrow, the Savannah Sparrow is usually paler, more finely streaked, lacks the “stick pin,” sometimes has some yellow in front of the eye, and has a notched tail. The White-throated Sparrow is a bit larger, often has yellow spots in front of the eyes (very faded in the Fall and Winter) and a white throat. It has moved down from the higher elevations where it nests, and some will stay all winter if there is food available. Juvenile White-crowned Sparrows usually appear in mid-October, migrating from the north of Canada. These juveniles can be confused with the American Tree Sparrow (which doesn’t show up until November); the tree sparrow also has an unstreaked breast and buffy sides, but it sports a “stick pin” in the middle of its breast. 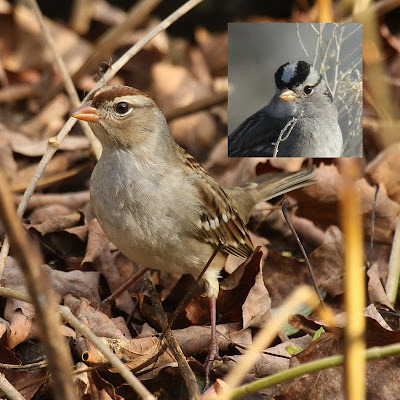 The young White-crowned Sparrow has brownish and buffy head stripes which hint at the bold black and white stripes of the slim and handsome adults. Dark-eyed Juncos, gray and white “snow birds” come down from the mountains and are gathering in their nomadic flocks for the Winter. There is great variation in the shades of gray on the juncos, ranging from near black to very pale gray. Occasionally the western race with rusty sides, known as “Oregon Juncos,” will appear in our neighborhoods as well. In late October, the large, deeply rufous-colored Fox Sparrow can be expected. It looks like an especially robust and handsome Song Sparrow. Becoming familiar with these common sparrows will also enable you to pick up the rare vagrant that will make you the envy of the local birding community. Some years ago an observer in Putney noticed a “mutant” sparrow among the half dozen species feeding outside of his living room window. It was a juvenile Harris’ Sparrow and was only the second confirmed sighting of this species in Vermont. The little brown birds that frequent our feeders are dull and drab only when we are bored and inattentive. They great variety and give us lots of opportunities to hone our observational skills. Great post on the sparrows. Awesome photos, Chris! Chris, beautiful images and great narrative! I'm finding myself more and more in love with those little brown sparrows and their subtle beauty. Terrific post, Chris! All the sparrows you featured in this wonderful post are quite beautiful. Great photographs!